When a noted anthropologist arrives at an ancient Anasazi Indian ruin dig for clay pots, she is at first angry to discover that the pre-Navajo burial site has already been despoiled, then terrified by what looms out of the darkness. 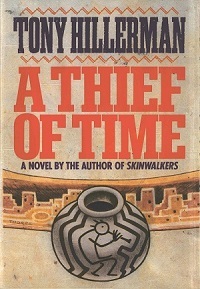 Weeks later, Lieutenant Joe Leaphorn, investigating a report to the Navajo Tribal Police that the anthropologist has been stealing precious artifacts, discovers she has also been reported as missing. The case turns sinister when Officer Jim Chee, on a routine search for missing excavating equipment, finds more than he expected near a similar dig. Leaphorn joins forces with Chee to unearth the past and solve a bizarre and mystifying series of murders that seem to have only one thing in common-the beautiful and very valuable Anasazi pots.